The test setup was exactly the same as used in the recent Thermalright Ultra-120 and Ultra-120 eXtreme preview. All the components of the test bench remained the same. All cooling tests were run with the components mounted in a standard mid-tower case. The idle and stress temperature tests are run with the case closed and standing as it would in most home setups. We do not use auxiliary fans in the test cooling case, except for the Northbridge fan attached to the 680i for overclocking. We tested with the same Scythe S-FLEX fan used in the Thermalright Ultra-120 review and the original Thermalright Ultra-120 eXtreme preview. 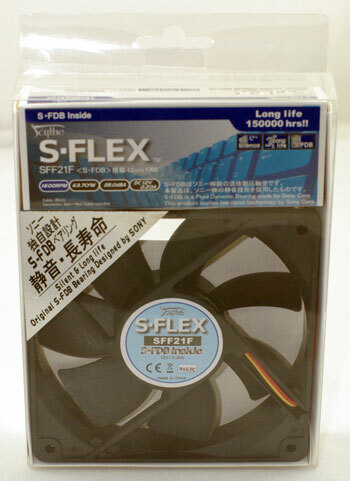 This excellent fan moves a lot of air, but still keeps noise low with the Sony developed Fluid Dynamic Bearing on the fan motor. All testing was with a single fan, as in the earlier Thermalright reviews. 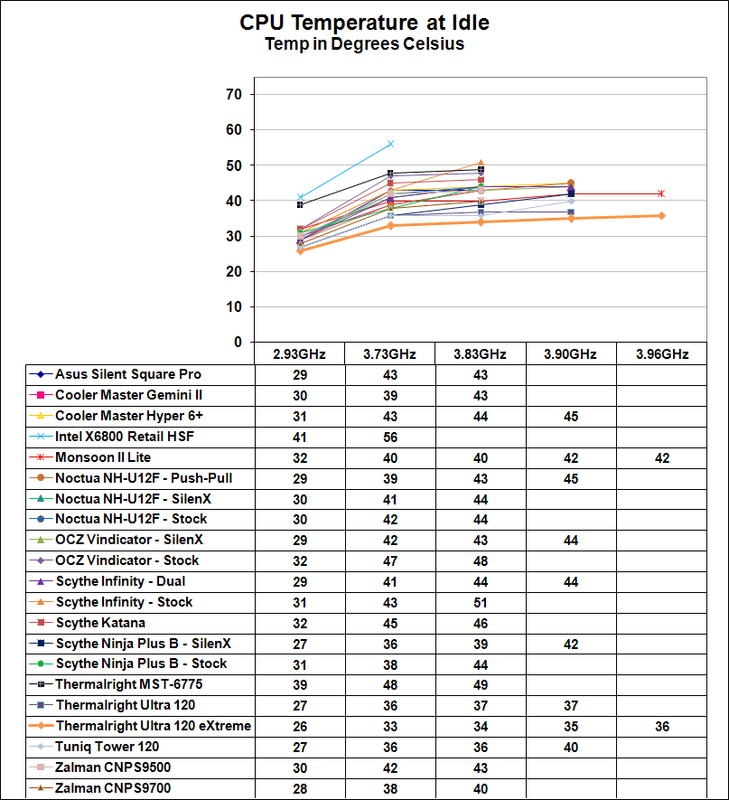 Across stock speed and all overclocks the retail Thermalright Ultra-120 eXtreme produced temperatures either identical to the prototype review or within 1C of the previous test results. 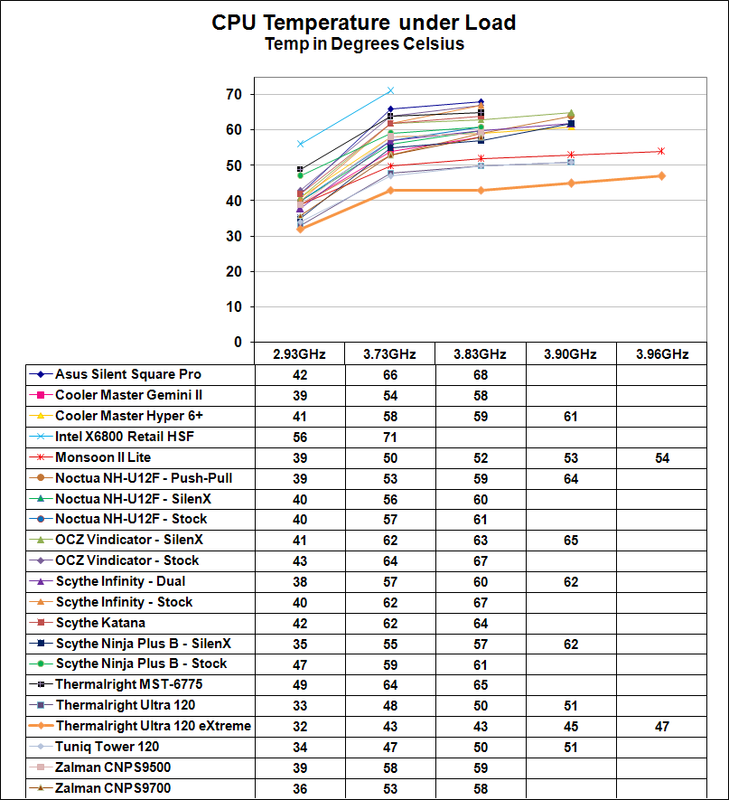 These are considered equivalent results and they verify that performance of the retail Thermalright Ultra-120 eXtreme is the same as we measured earlier. The Ultra-120 and Tuniq Tower 120 set some very high performance standards for effective cooling in overclocking. By 3.73GHz, the highest stable overclock with the Intel retail HSF, the temperature at idle was 56C. This compared to 36C with both the Ultra-120 and the Tuniq Tower 120. The extra heatpipes of the Ultra-120 eXtreme lower this to an even better 33C. By 3.90 GHz, the previous best overclock, the idle for the Tuniq is 40C and the Ultra-120 is 37C. The Thermalright Ultra-120 eXtreme drops the idle 2C lower to 35C, and is still at 36C at the highest stable overclock of 3.94GHz. This is very close to the performance level of the Monsoon II which uses active TEC cooling and not air alone. 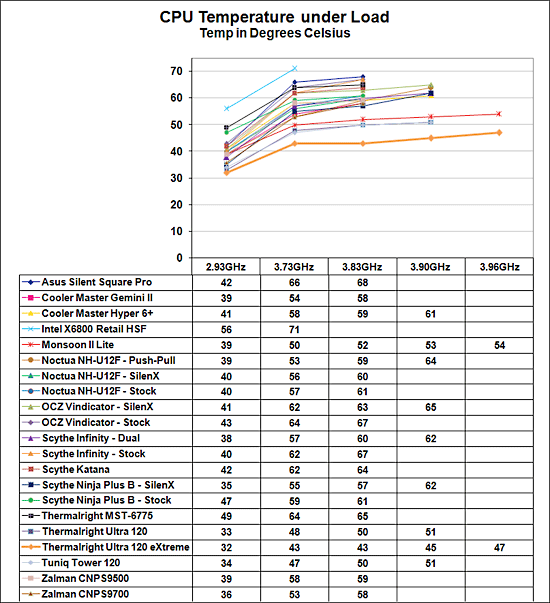 Cooling efficiency of the Ultra-120 eXtreme under load conditions was the best tested so far by a wide margin. Compared to the Ultra-120, Tuniq Tower 120 and other recently top CPU coolers it is clear that the extra heatpipes in the Ultra-120 eXtreme are very effective in extending cooling performance. 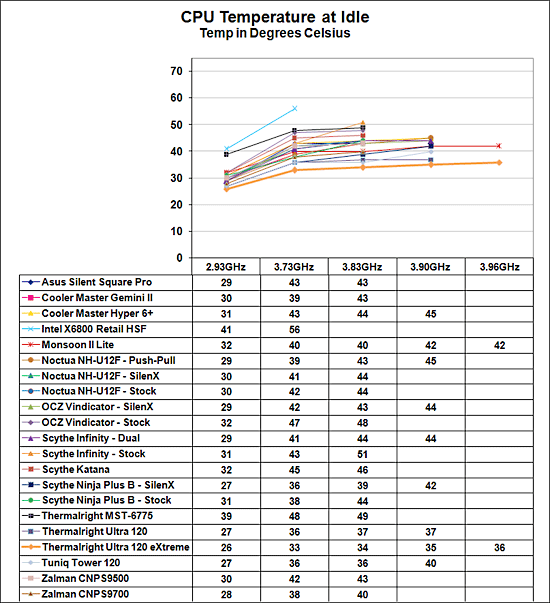 As you can see in the chart above the cooling efficiency of the Ultra-120 eXtreme under load is striking. Where the Tuniq Tower 120 and Ultra-120 mirror each other from 2.93GHz to 3.90GHz, the Thermalright Ultra-120 eXtreme creates a new performance curve at a lower temperature. The Tuniq and Ultra-120 are at 47/48 at 3.73GHz compared to the Intel retail at 71C. The Ultra-120 eXtreme shatters those cooling results by maintaining 43C. The advantage increases even more as the overclock is raised. By 3.90 GHz, which is the highest overclock the Tuniq and Thermalright Ultra-120 could reach with stability, the Tuniq and Ultra-120 are both at 51C, which was the best performance among coolers tested so far. The Ultra-120 eXtreme, which is the same cooler as the Ultra-120 with just two additional heatpipes, bests both previous leaders by 6C with a 3.90GHz temperature of 45C. The highest stable overclock we could achieve with the retail eXtreme was 3.93 GHz compared to the 3.94GHz achieved in the original review. Both results are higher than any achieved with any other cooler tested so far. We suspect this tiny difference is the result of either normal variation in test results, or even more likely the 2C higher ambient temperature in our test room compared to the room temperature in the initial review. Congrats for taking the time to go back and test a retail version. That's a feather in your cap for sure. We of course want to see this compared to the IFX cooler, with and without the back cooling device. Questions: was the cooler mounted horizontally with the fan facing up? Were you using push or pull on the fan? I understand the economy and potential convenience of getting the all the data, for all the heatsinks, and all the CPU speed points into one graph, but maybe we're close to (or have already reached) the point of these graphs being too busy to be helpful. Maybe breaking the data into a bar graph for each CPU speed point (that would be five graphs at this point) would make it easier to see what is going on. It helps to click the graph for the larger version. "All cooling tests are run with the components mounted in a standard mid-tower case. The idle and stress temperature tests are run with the case closed and standing as it would in most home setups. We do not use auxiliary fans in the test cooling case, except for the Northbridge fan attached to the 680i for overclocking." For these tests the Ambient room temp was measured as 22C, past tests have been 20C. This is mentioned in the review. "(unless you're going for silence and want to run fanless)"
I understand that AT's primary objective is not silencing PCs. But with that comment, I wonder how well the eXtreme perform fanless compared to the Scythe Ninja - one of the favorite at SPCR. I agree, they seem to have some weird fetish about saying things without wanting to substantiate them. I mean, why put out that remark if you're not going to elaborate on it with some information? There's no private info about fanless operation. I didn't supply data on fanless operation because our current test bed is not well set up for fanlees, and therefore I didn't want to mislead readers with fanless performance data that is likley much poorer than you can actually achieve with the Ultra-120 eXtreme. We have explained this in every review recently of a cooler that could be used fanless.